Pharmacists want Congress to investigate a sharp increase in medicinal costs. A pharmacist pours Truvada pills back into the bottle at Jack's Pharmacy on November 23, 2010 in San Anselmo, California. Jan. 31, 2014, 12:05 a.m.
Drug costs are rising, but in the opaque world of health care pri­cing, fig­ur­ing out what’s driv­ing the in­crease has be­come dif­fi­cult — if not im­possible. Non­ethe­less, phar­macists want Con­gress to try. Vexed by triple- or quad­ruple-di­git per­cent in­creases in drug costs, the Na­tion­al Com­munity Phar­macists As­so­ci­ation is ask­ing law­makers to hold a hear­ing to find out why. The prob­lem, the group says, is that phar­macists are get­ting gouged. Phar­macists try­ing to get their hands on gen­er­ic drugs such as Pravast­at­in, a drug for pa­tients with high cho­les­ter­ol, or the an­it­bi­ot­ic Doxy­cyc­line faced price spikes up­wards of 1,000 per­cent in 2013, ac­cord­ing to a sur­vey by the group. Some 77 per­cent of phar­macists sur­veyed by the as­so­ci­ation said in the last six months of 2013 they ex­per­i­enced 26 or more in­stances of a large up­swing in the ac­quis­i­tion price of a gen­er­ic drug. An ad­di­tion­al 84 per­cent said the price fluc­tu­ations im­peded their abil­ity to provide care and re­main in busi­ness, as some com­munity phar­ma­cies could not fill pre­scrip­tions that would res­ult in losses and some pa­tients de­clined med­ic­a­tion that would have emp­tied their wal­lets. The find­ings are con­sist­ent with re­ports na­tion­wide that gen­er­ic-drug prices are ex­per­i­en­cing bank-break­ing price in­creases. Health care and phar­ma­ceut­ic­al con­sult­ing firm Pem­broke Con­sult­ing, for in­stance, found that with­in the last year, more than a dozen drugs hit prices 10 times their stand­ard rate. NCPA wants Con­gress to hold a hear­ing to find out what’s driv­ing the price points and wheth­er any­thing can be done by the feds to stop the trend. But one primary-care doc­tor, Dav­id Belk, says he’s sus­pi­cious that the fault lies with drug com­pan­ies. The San Fran­cisco-based blog­ger has ob­served price jumps in single doses of med­ic­a­tion, where one size dosage of a drug was very ex­pens­ive and the oth­er dosages of that same drug were at a more reas­on­able cost. 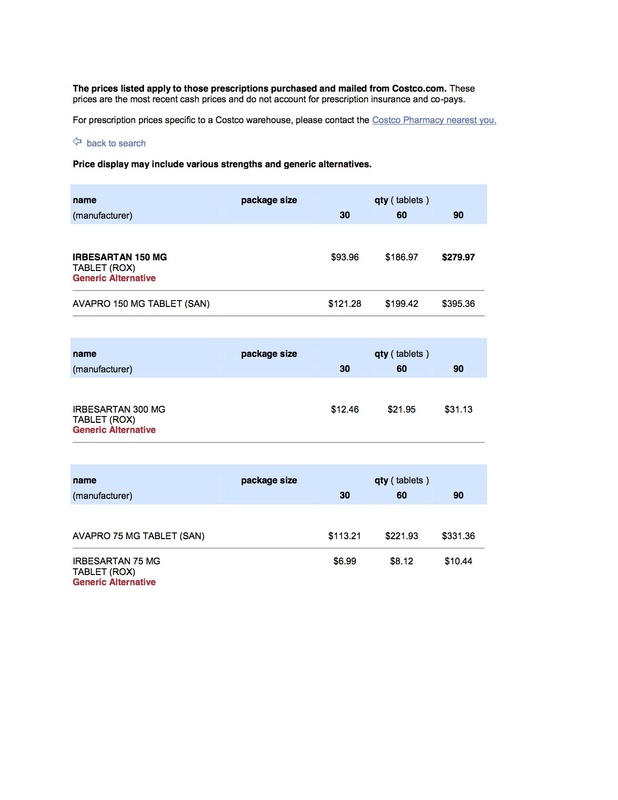 Belk took a clip of the Costco web­site after he saw the gen­er­ic drug Irbe­sartan, a med­ic­a­tion for high blood pres­sure, hit nearly $300 for a 90-day sup­ply of the 150 mg tab­let. Yet for the 90-day sup­ply of the 300 mg tab­let, con­sumers paid only $30. That trend, Belk said, leaves phar­ma­cies hanging out to dry with the ex­tra cost. While Belk pro­poses to turn pa­tients in­to edu­cated con­sumers by cre­at­ing trans­par­ency about pre­scrip­tion drug costs at the doc­tor’s of­fice, the prob­lem re­mains that phar­macists can’t place their fin­ger on why gen­er­ic drugs seem to cost more than they used to—or at least, ex­per­i­ence ex­treme price vari­ations throughout the year. Dan Mendel­son, CEO of con­sult­ing firm Avalere Health, cred­its the ef­fect­ive­ness and pop­ular­ity of gen­er­ic drugs as one reas­on phar­ma­ceut­ic­al com­pan­ies are able to charge more. Mendel­son said his prob­lem with get­ting Con­gress in­volved in the situ­ation is that it sug­gests they should step in­to the mar­ket and im­pose price con­trols. Some­times, he said, the spikes are eas­ily ex­plained, such as when Doxy­cyc­line ex­per­i­enced a man­u­fac­tur­ing prob­lem and had a tem­por­ary short­age. Even high­er prices for gen­er­ics could be on the ho­ri­zon, as all health plans offered on the Af­ford­able Care Act ex­changes must cov­er pre­scrip­tion drugs, which could in­crease use and de­mand among con­sumers. The Af­ford­able Care Act, however, doesn’t in­clude any spe­cif­ic pro­vi­sions to re­duce the over­all cost of drugs. But gen­er­ics are still cheap­er than their brand-name coun­ter­parts. And with more pat­ents for block­buster drugs set to ex­pire by 2018, they’ll con­tin­ue to be a com­pet­it­ive op­tion on the mar­ket.